College football fans are some of the most passionate in the sports world. With the college football series by EA SPORTS, that same passion shines through with each iteration. From pointing out the smallest incorrect stadium detail to manually adjusting the roster for every team, the passionate fanbase demands a lot from the game each year. 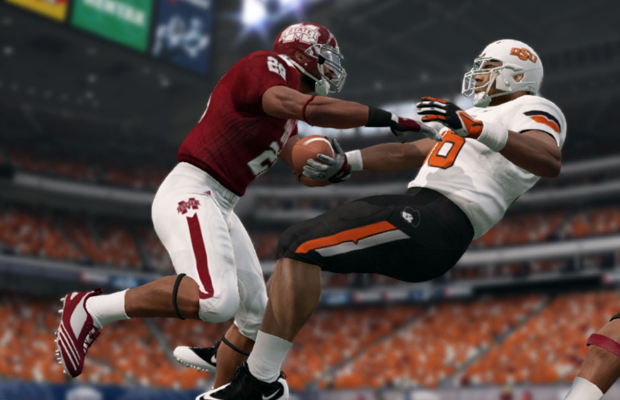 With NCAA Football 14, EA SPORTS has shaken up the traditional formula of the game quite a bit. The addition of the Infinity Engine, Ultimate Team, and the changes to recruiting headline the features for the game but a myriad of smaller updates have been applied as well. Can so many changes in one year be executed well enough to showcase a great game? Once you’ve stepped onto the field, the Infinity Engine is extremely apparent. This is the first year that the physics-based engine has been featured in the NCAA Football series, and it’s a welcomed addition. Players now feel like they have weight to them, and you’ll find some incredible collisions in the open field. While you will notice a few small subset of animations that don’t seem to “fit”, those occurrences are few & far between. In terms of gameplay, the read option will be one of the most recognized features. The development team added on-screen indicators to let players know who to watch out for on both sides of the ball, but it seems like it should be removed on the higher difficulty levels. That small problem aside, the read options becomes an unreal play to stop at times. Due to the defensive players being sucked into blocking animations, the user often feels they lose control as a defender. While the blocking has improved this year, an argument can easily be made that it’s either too good or feels “cheap” at times with suction blocks. Odd occurrences also flare up as you compete against the computer. Quarterbacks can often be either unbelievably accurate or incredibly incompetent. With there being no such middle ground seemingly available, you’re left with rather odd situations. When quarterbacks lean more towards being incompetent, they’ll do things such as hike the ball and immediately throw it out of bounds. Looking for an “intentional grounding” penalty? Don’t, because it appears to be missing from this year’s version. The development team has also introduced a new sprint system in NCAA Football 14. Gone are the days where you hike the ball and just hold down the sprint button on running plays. Players have a set amount of energy they can use on each play. Once the ball is hiked or the player has received the ball, you can then choose to use the sprint in whatever manner you choose. As the player moves down the field with the sprint button being held, they’ll eventually reach their top speed and you won’t need to hold the button down anymore. This mechanism can be hard for players to get used to at first, but ultimately helps separate the “good” from the “great” players. The sprint feature is a great idea, but appears to be executed only halfway. The fatigue that a player may take throughout a game doesn’t impact their ability to sprint throughout the game. Giving a running back the ball 5 times in a game or 40 times in a game yields the same sprint ability. There’s no real bonus here for using multiple players at a position outside of the rare injury occurrence in this year’s game. The new dynasty recruiting system has taken away the tedious tasks of recruiting each week, and instead replaced it with a system that streamlines the tasks but keeps the same amount of depth. To start the season, you’ll be presented with a pool of points that you can then spread out to each recruit. At the beginning of the process you’ll only be able to use a maximum of 500 points per recruit, but that can be increased as you unlock various skill tree elements. Once you’re in the off-season, however, you can throw your entire pool of points at a single player. This makes for an intense battle for recruits in the off-season, allowing you to rope in that one recruit who could turn around your program. The majority of features return for recruiting, but gone are the days of promising a player an item during the season to help land them. Instead, the only promises that you’re able to use are those used to keep a player from either transferring or leaving for the NFL. Also new this year is the coaching skill tree. You’re able to unlock various “skills” that can be used for recruiting or in-game advantages. You earn XP in each game that you play within the season that is ultimately accumulated for a coach level. As you increase your coach level by reaching the certain amount of points needed, you’re given a token to purchase a new skill. In Online Dynasties, spending your tokens on the right skill can have a ripple effect on your recruiting or a game late in the season. Ultimate Team makes its first appearance in the NCAA Football series in this year. Since the game can’t license current players, it makes use of its license with the NFLPA and showcases current NFL players in their college days. It’s an interesting dynamic, and often reminds you of how many great college players you’ve forgotten about. While you may not fear a player like Braylon Edwards in the NFL much anymore, seeing him in NCAA Football 14 can strike fear in your heart. This version of Ultimate Team also presents various collections for players who either won or were in the running for the Heisman, as well as team collections. Playing against a collection of some of the greatest players ever at the University of Miami is a painful challenge, but rightfully so. While the NCAA Football series may not sell nearly what Madden & FIFA do, the Ultimate Team in NCAA Football 14 shows a solid base to be one of the best out of the group. With so many changes happening to NCAA football 14 this year, it’s understandable to see where the game still needs some fine tuning. Ultimate Team provides a solid base, but still isn’t nearly as deep as other EA SPORTS offerings. This year’s version had the potential to be an all-time great, but a few missteps keep it just outside the fence peaking over. NCAA Football 14 is still worth your money, however, and provides a great way to spend your time this Summer.